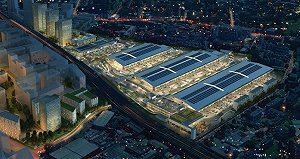 Enabling works on the New Covent Garden Market in Nine Elms is expected to start this summer, it has been announced. Commercial Planning agreements have now been reached between joint venture development partners, Vinci St Mowden, and the Covent Garden Market Authority (CGMA). The project will take approximately 10 years to complete and will involve regenerating 500,000 sq ft of new market facilities across a 37 acre site, housing 200 market businesses. 20 acres of land will be used to develop 3,000 homes, 135,000 sq ft of office space, and 100,000 sq ft of leisure and community facilities, such as cafes, restaurants, “incubation spaces” for food start-ups, and shops. The £2bn scheme is the largest in the Nine Elms Regeneration area, which is also home to the Battersea Power Station redevelopment site and the new American Embassy.